Let’s take a step back before hitting the content challenges to align on vocabulary. 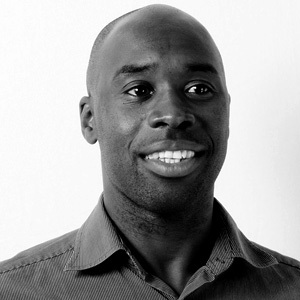 What is a personalised experience? A personalised experience has the right mix of context and content. The context part is the “you” piece. 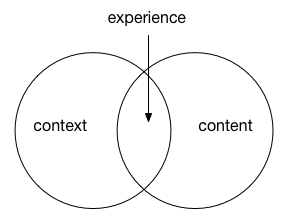 Context is a combination of first, second and third party data that provides the right time and place for an experience to happen. Collecting, processing and activating all the data to create the context is all the hard work required to setup the optimal environment to deliver that killer consumer message. With the stage set and primed by the context, it’s time to unleash the content. We need to deliver that killer message, in the right format, to bring that personalised experience to life. There are many different types of content to deliver; a blog, a booking, an offer, a flight, a promotion, an article, and so on. The right content delivered within the right context results is a great experience. Falling short on either context or content diminishes the experience. We’re going to assume those data folks have got the context part right so that we can focus on delivering great content. • We can’t repurpose content originating in one channel (e.g. Web) for use within another (e.g. Print). • We don’t know what content we really have available across the enterprise. • We can’t find content we know we have. • We can’t share content easily. • We can’t produce content fast enough. • We don’t know who’s producing what content, to what plan, and for what purpose. • We can’t localise content without entering a world of pain. • We can’t afford to procure the right content in our local markets. • We know what need to do but don’t know where or how to start. • We can’t leverage our own internal content so have to go outside to progress. Unilever are looking to build an insights engine[https://hbr.org/2016/09/building-an-insights-engine] to tackle the data part of the experience problem. I see the content engine being the other the side of the same personalised experience coin. We could replace Unilever in the quote above with any other brand name. They are all facing the same challenges when it comes to operationalising personalised experiences. In order to deliver personalised experiences, we need to solve for predictable, repeatable and scalable content. The content engine is a draft model for building content as a function within the enterprise. It not a technology solution, although technology will definitely enable it. Instead, it is a framework, a blueprint and set of principles for getting content everywhere it needs to be. Let’s explore the content engine a little more in the next post.